Your hopes and dreams do contain a fair amount of fantasy, and every once in a while you need to check yourself and to make sure you are seeing things as they really are. This is not meant to bring you down, but, rather to allow you not to be mesmerized by the bling and other various shiny objects being dangled in front of you by the Universe. Sometimes, others are not totally forthcoming, and, as you must be aware by now, many wear masks, creating a false identity, and giving others the ability to pull the wool over your eyes. Not so fast! The Sun, Jupiter and Mercury are all currently in the sign of Scorpio, the great detective, and you do not need to be a Scorpio to utilize these energies and see through any smokescreens which may be designed to deceive. They can come on many levels, but anything which is not totally truthful at this time, is simply unacceptable. Take a look at everything before you today, in a realistic manner, even if it is your own hopes and dreams, and not involving anyone else. Are you being honest with yourself about the practicality of your intentions? 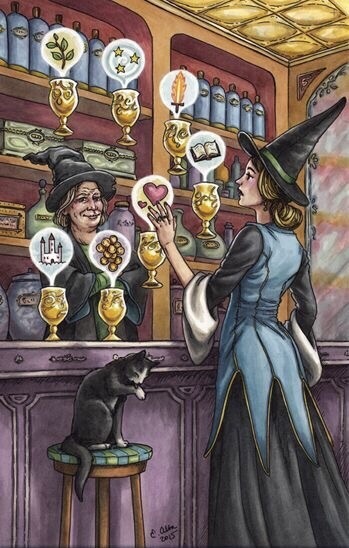 This entry was posted in Card of the Day, General Tarot, Love and Finance, Patreon, Readings, YouTube Videos and tagged 7 of Cups, Card of the Day, Guidance, Path, Reading, Tarot.